i3d Review 2019: Is i3d a Good Hosting? Based in Rotterdam, i3D.net offers a long list of hosting solutions to their existing customer base of more than 31,000 all around the world. They own and operate their own data centers, which span six continents worldwide. Founded in 2002, i3D.net is a Dutch web hosting company based in Rotterdam. They currently serve over 31,000 satisfied customers out of 24 data centers all over the world. For over 15 years, this managed hosting vendor has reliably provided online infrastructure services to a broad range of sectors, including the public sector, educational institutions, healthcare facilities, e-commerce businesses, sports shops, and even professional gaming networks. The main focus of this company is to bring innovative industry-leading technologies to the corporate business market. i3D.net’s extensive offerings include domain name registration, shared hosting, reseller solutions, and even complex cloud and dedicated servers. However, what really separates this provider from the competition are their gaming servers. Their gaming solutions encompass everything from the most popular PC, Xbox, and PlayStation games to TeamSpeak 3 and other VOIP networks. They feature an excellent range of ranked and unranked game servers, which is likely why they’re one of the largest game server providers in the world. Along with their Starter, Basic, Advanced, and Premium shared hosting plans, i3D.net offers various reseller hosting plans. Delivered through load balancing technology and their cloud infrastructure, they bring scalable IT environments to their clients, so each account can be freely configured to their unique business requirements. i3D.net guarantees an uptime of 99.9%. Their cloud hosting platform is also particularly noteworthy. Built on Microsoft Cloud OS, i3D.net has developed Red Cloud, their own enterprise-level cloud solution that offers an extremely powerful and robust network. Here, you have three options: a subscription-based model that can handle low resource usages and is recommended for a maximum of 5 VMs, a credit-based model with unlimited resources so that you’re only billed for whatever you use, or another subscription-based model best-suited to users who anticipate high resource consumption and can handle up to 50 VMs. With Red Cloud, you get a fully-redundant cloud infrastructure with the lowest latencies, and can quickly set up a website, any CMSes you desire, or perhaps any number of virtual machines you’d like. 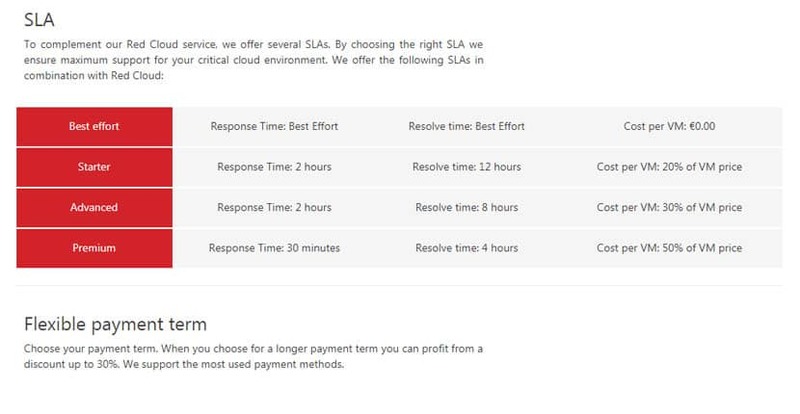 i3D.net offers different SLAs depending on your needs; each SLA will come with its own guaranteed response time and resolution time. Other than that, i3D.net guarantees a network uptime of 99.99% apart from regularly scheduled maintenance. I actually found i3D.net’s packages to be priced slightly higher than what you’d expect with the given resources and features. You get a free domain name with all their shared hosting packages, but it still doesn’t seem to justify their more expensive rates. The same goes for their cloud and gaming servers; they may be one of the largest gaming server providers in the world, but that might be due to their extensive offerings rather than because of their affordable rates. They also do not appear to have a money back guarantee, and each premium SLA comes at an additional cost — sometimes a rather hefty one at that. One upside is their support: they offer live chat, phone, email, and a support ticket system. In my experience, they’re very fast at responding to clients (especially if you’re submitting a ticket through your client portal), and they have local phone support lines for various parts of the Netherlands as well as for California, the United States. In addition, they’re active on web hosting forums and independent vendor review websites, though of course those channels generally aren’t the best way to reach them. i3D.net is one of the best hosting providers in the Netherlands, with an extensive portfolio of services that can cater to organizations of all types and sizes. Their services may be a little more expensive than expected, but as the saying goes, you get what you pay for. Wondering how i3d stacks up against other Web Hosting companies? Enter any other Web Hosting company and we will give you a side-by-side comparison.